Stretching back decades, claims concerning Johnson & Johnson’s baby powder have revealed a correlation between regular usage and the development of ovarian cancer. However, based on recent reports and an investigation by Reuters, ovarian cancer is not the only risk you have to worry about. In rare instances, consumers have developed mesothelioma, a condition contracted after exposure to asbestos – even if it was decades ago – and allege Johnson & Johnson’s baby powder is to blame. Following Reuters’ findings, the company’s stock sharply dropped and a social media campaign to soften the talcum powder-based product’s image unfolded. As Johnson & Johnson does damage control, results in the courtroom are not always clear cut. In 35 out of 40 cases to date concerning cancer and talcum powder, the courts ruled in favor of Johnson & Johnson. In others going back to the 1950s, the trace amounts of asbestos found helped sway the court toward the plaintiff. According to figures from Bloomberg Intelligence, Johnson & Johnson may have to pay out as much as $20 billion to settle as many as 12,000 impending claims. Yet, if you believe baby powder usage contributed to your or a loved one’s mesothelioma, here’s what you need to know. On a very general level, talc – found in baby powder – and asbestos – used for fire prevention – are mined from the same source. Based on once-confidential documents Johnson & Johnson had to hand over for its recent flood of mass tort claims and examined by Reuters, Johnson & Johnson identified asbestos in their product in the 1950s. Initially, no one considered cancer as a possible risk. Rather, the company worried the material made the powder abrasive. 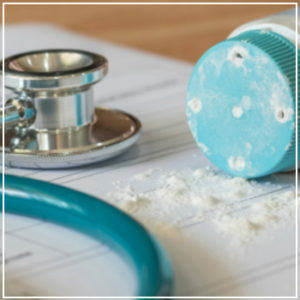 Johnson & Johnson and the FDA: By the mid-‘70s, the FDA started paying closer attention to talc and asbestos in consumer goods. While Johnson & Johnson identified asbestos in three samples from 1972 to 1975, the company claimed all samples were free of asbestos. The FDA’s testing found similar results, but rudimentary equipment at the time was unable to detect the substance’s fine chrysotile fibers. Johnson & Johnson Conducted Tests: To show that babies were exposed to only a small amount of baby powder, the company’s team conducted diapering tests with a dummy to prove their product’s asbestos exposure levels were below OSHA’s workplace limits. Results indicated that exposure for a theoretical baby was far below what was then the accepted limit. Mount Sinai Tests: What counts as significant exposure? Testing conducted by Mount Sinai Health System – funded by Johnson & Johnson’s executives – initially reported that the company’s talc products had no traces of asbestos, but researchers had found small amounts. In response, Mt. Sinai’s president claimed their researchers had been given old batches of talc and that newer formulations, endorsed by Mount Sinai’s pediatricians, were safer. What counts as asbestos? In talc, two forms may be found: Fine, fibrous asbestiform tremolite and larger fragments from non-asbestiform tremolite. In 1992, OSHA discounted the non-asbestiform tremolite fragments, instead applying its definition strictly to the fibrous tremolite form. However, testing up to this point does not distinguish between the two. With its microscope tests, only a very small amount of Johnson & Johnson’s talc is ever tested. As a result, the company cannot guarantee its product is completely asbestos free and labels reflect this. Johnson & Johnson’s source continues to change. Talc in older products came from Italy and Vermont, but more recent formulations use talc mined in China, supplied through Imerys Talc America. Imerys claims that its tests bring up no traces of asbestos. Rather than owning up to the results, Johnson & Johnson routinely claims tests finding asbestos in its producers are “outliers” contaminated by stray or outside fibers. Since plaintiffs started filing claims against Johnson & Johnson in the 1990s, outside lab results have found small amounts of asbestos in multiple samples, including products sold on shelves, bought through eBay and even in the company’s museum. Although Reuters’ findings and a subsequent New York Times report focus on Johnson & Johnson’s and the FDA’s reporting, studies conducted outside of the U.S. have come across similar results. According to a report in Business Insider, a paper by Environment and Climate Change Canada analyzed 29 studies that examined the correlation between baby powder usage and ovarian cancer, and further looked at talc-based products for body, face and feet. The report found that inhaling talc has a long-term, cumulative effect. Specifically, the ultra-fine particles enter the lungs and stay there, eventually contributing to respiratory issues and scarring the lung tissue. Over time, someone who inhales talc regularly may have difficulty breathing and develop pulmonary fibrosis. Do you believe you’ve developed ovarian cancer or mesothelioma after using baby powder for a number of years? You may have a claim against Johnson & Johnson or a similar manufacturer. To bring your case to our attention, contact us today to speak with a product liability lawyer.